Report and photos by Renzo Del Bianco from the annual Anatolian Eagle exercise hosted by the Turkish Air Force. 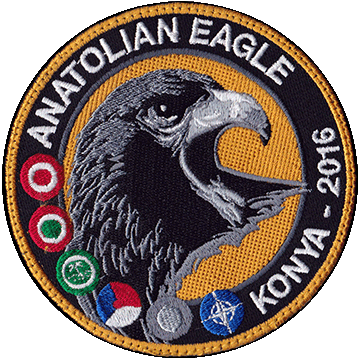 The 2016 edition of the Anatolian Eagle took place at Konya Air Base between May 30 and June 10 and involved aerial components of the Turkish Air Force, Turkish Navy, Italian Air Force, Pakistan Air Force, Royal Saudi Air Force, Royal Netherlands Air Force and the NATO AEW&C Force. Following Turkish Air Force participation in Red Flag in 1997 and a pair of bi-lateral exercises in 1998 with the U.S. Air Force, the Anatolian Eagle exercises started in June 2001 at Konya Air Base involving the Turkish Air Force, United States Air Force and Israeli Air Force. The reason of setting up the exercise was to reduce the loss of pilots and aircraft caused by unexperience and to increase the interoperability among air forces of different countries. Throughout all these years many facilities have been built, such as the wide aircraft ramp named Eagle, surrounded by buildings for maintenance and storage, where foreign and national aerial assets are stationing during the exercise. From 2001 to 2016 the Anatolian Eagle exercises has hosted in total more than 2600 aircraft from 14 countries and NATO, and it has produced about 22870 sorties. With large exercise areas available over land and sea, that extend 50,000 square miles in surface and up to 50,000 feet from the ground, equipped with modern threat systems, the Turkish Air Force can organize an absolute full-scale exercise similar to Red Flag and Maple Flag. In Anatolian Eagle exercises there are two adversary aerial components, Red Force and Blue Force. Red Force is formed by Konya AB resident unit 132 Filo, which operates the F-16 in the aggressor role, and by ground controllers, codenamed Redeye, which monitor the operations over the range and make use of different threat systems against Blue Force aircraft. Blue Force is formed by deployed units (national and foreign) assisted by NATO E-3A (Konya is an Forward Operating Base for NATO’s AEW&C Force) or resident E-7T belonging to 131 Filo. Resident helicopters UH-1H and AS.532AL belonging to 135 Filo participate by carrying out Combat Search and Rescue for Blue Force. All participating aircraft are controlled in real time by a White Force. This component develops scenarios, establishes different level of training and composition of aerial assets according to the different scheduled missions (CSAR, CAS, SEAD, AAR, A-G, DCA, etc.) and, of course, analyzes results of the missions with debriefing for the participating crews. The pictures of this report were taken between Wednesday, June 8, and Friday, June 10. Two different missions were usually flown each day. During our stay, on Wednesday two missions were launched and on Thursday morning the last Eagle mission of the exercise was flown. Afterwards we were able to witness the afternoon departures of all Turkish Air Force F-16s and F-4s, as well as the Italian Tornado IDS/ECR aircraft to their home bases. The following day, on Friday morning, the Pakistani F-16s and Saudi Tornados departed to their respective countries. The RSAF Tornados were supported by both the new Airbus 330 Multi-Role Tanker Transport as well as the KE-3A tanker conversion based on the classic Boeing 707. I’d like to thank Turkish Air Force and Public Affairs, as well as 3űncű Ana Jet Üs personnel, in enabling us to take pictures from wonderful locations and for having sent exhaustive news regarding the exercise in advance.